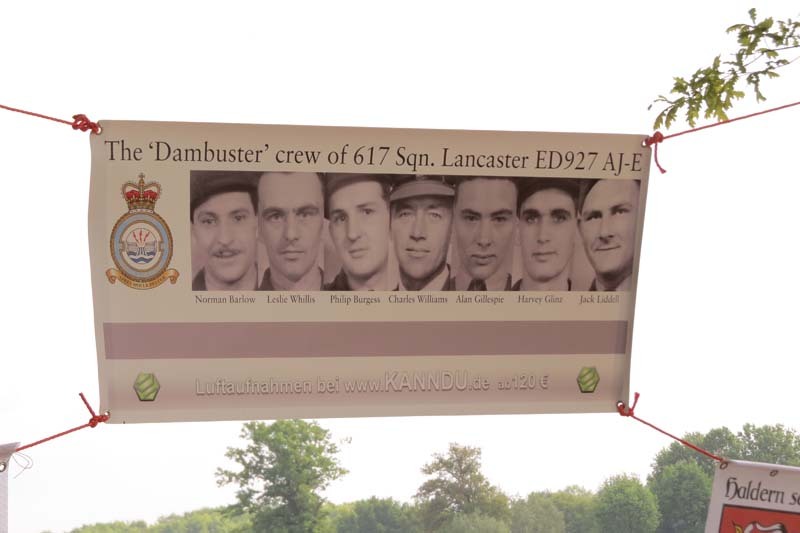 More Canadian Dambuster families gathered together in Ontario at the weekend, for a second event to commemorate the 75th anniversary of the Dams Raid. This took place at the Canadian Warplane Heritage Museum in Hamilton, Ontario, which is the home of Canada’s only flying Lancaster aircraft. 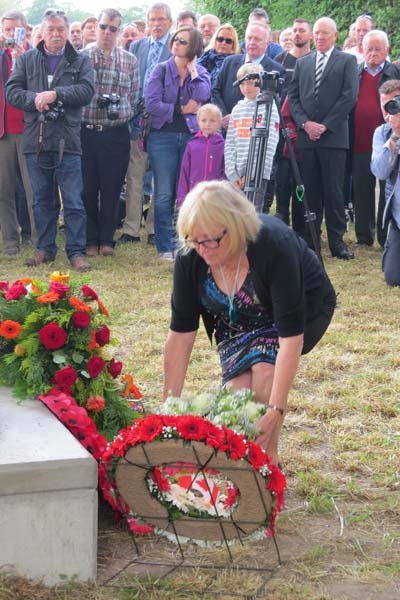 Six families were represented, including those of Harvey Glinz, Stefan Oancia and Frank Garbas, who weren’t able to get to the gathering two weeks ago in Nanton, Alberta. 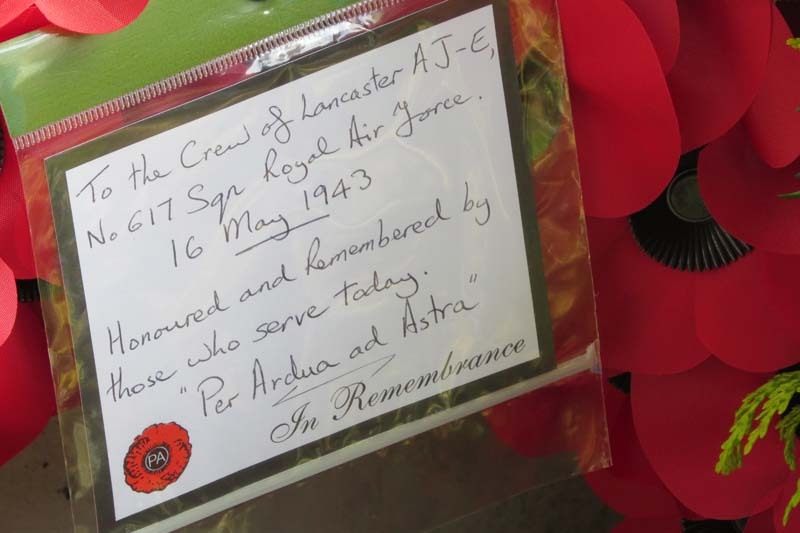 The picture above shows the attendees in front of the Lancaster, which is now carrying the code letters AJ-B, the same as that used on the Dams Raid by the crew captained by Flt Lt Bill Astell. 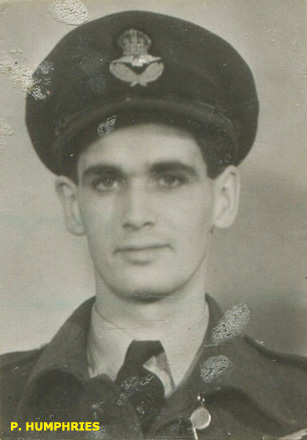 This included two men from Hamilton, Ontario – Albert Garshowitz and Frank Garbas. 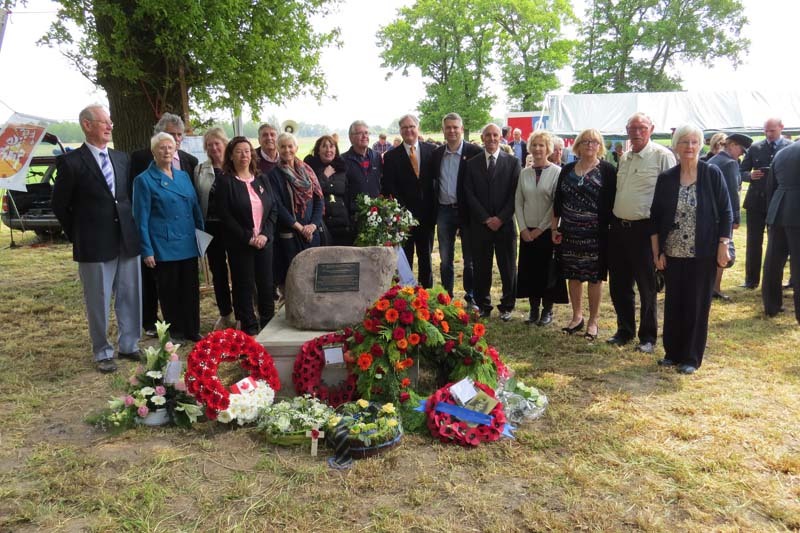 Several hundred people gathered on Sunday 17 May 2015 on the edge of a small wood in Haldern, north western Germany, to pay tribute to the crew of Dams Raid Lancaster AJ-E, piloted by Flt Lt Norman Barlow DFC. 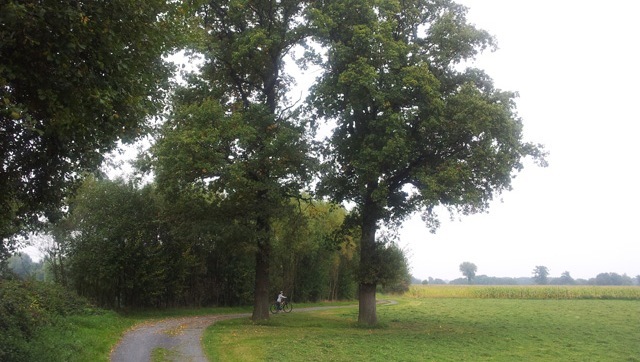 This was the spot where the aircraft crashed shortly before midnight on the night of 16 May 1943, en route to attack the Sorpe Dam. 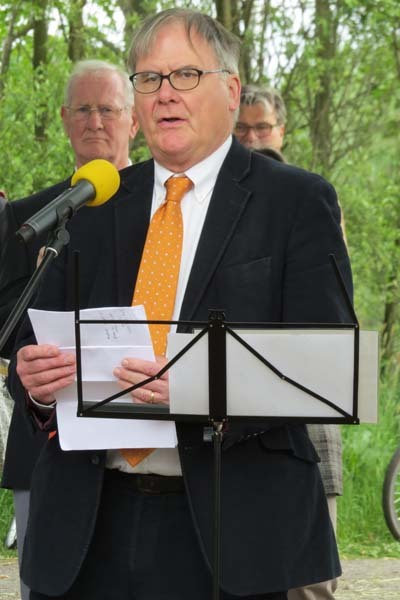 Some of Norman Barlow’s letters home to his mother in Australia were read out during the ceremony. 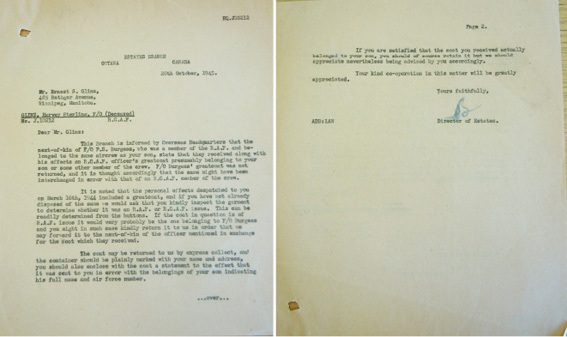 In one, written on 3 May 1943, he told her about the new aircraft he had been assigned for the Dams Raid. “I have just got a brand new machine. “E” for Edward or Elsie or Elliott. I hope I am as lucky as I was with “G” for George”. Sadly, E-Edward would not turn out to be not a lucky machine for Norman and his crew, and they were all killed instantly in the crash. 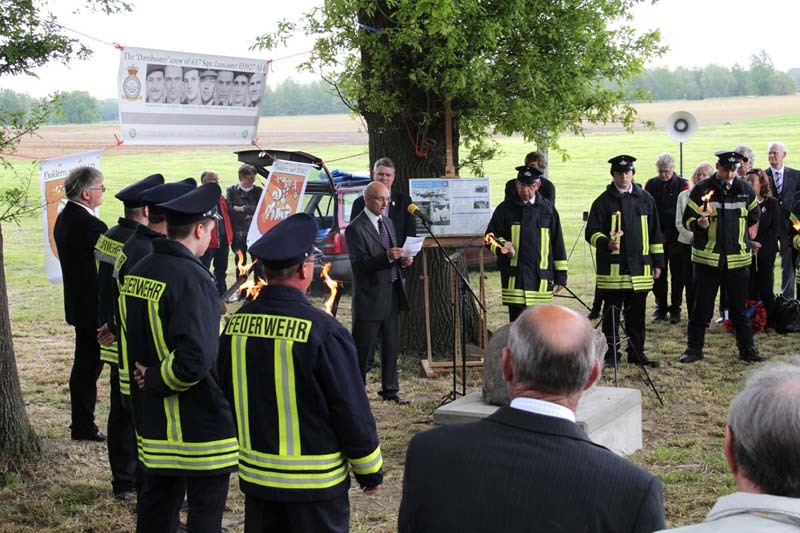 For seventy years, the site was not marked in any way, but then in 2013 local historian Volker Schürmann began a campaign to have a permanent memorial established. He organised a public appeal which succeded in raising the funds, after many generous donations from supporters from around the world. 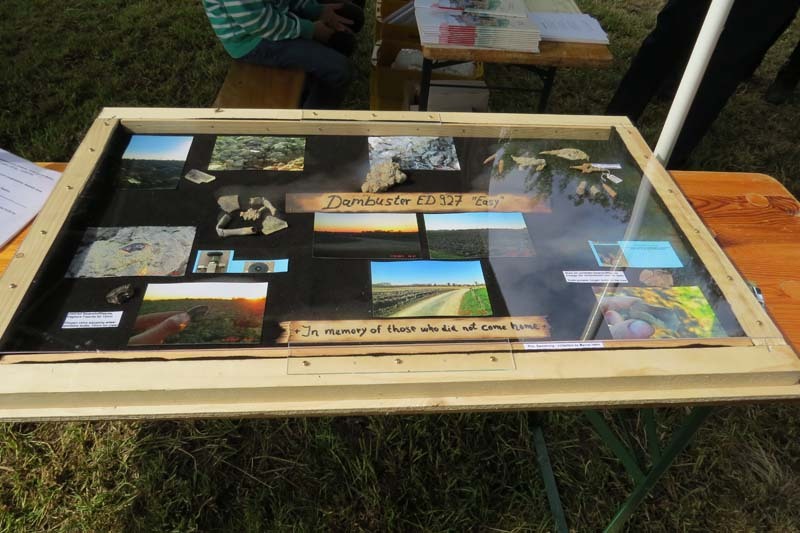 There were further donations of materials from the local community, and the farmer on whose land the aircraft crashed was kind enough to make a space available. 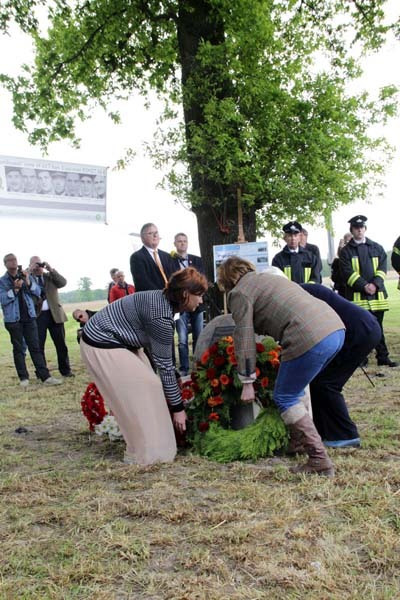 Relatives and representatives of five of the crew travelled to Germany, and unveiled the memorial. 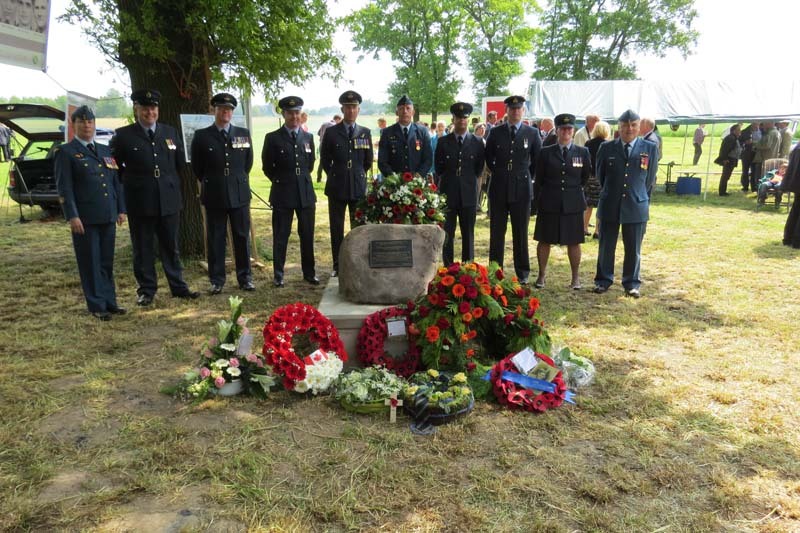 Wreathes were also laid by the Royal Air Force and the Royal Canadian Air Force, by other organisations, and by the local community. 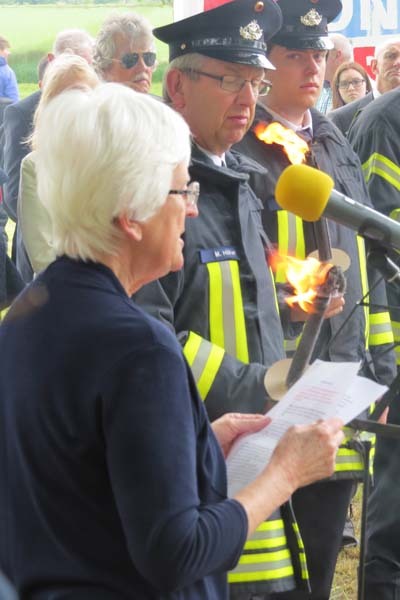 A guard of honour was provided by the Haldern Fire Brigade, and musical tributes were played by the Haldern Brass Band. 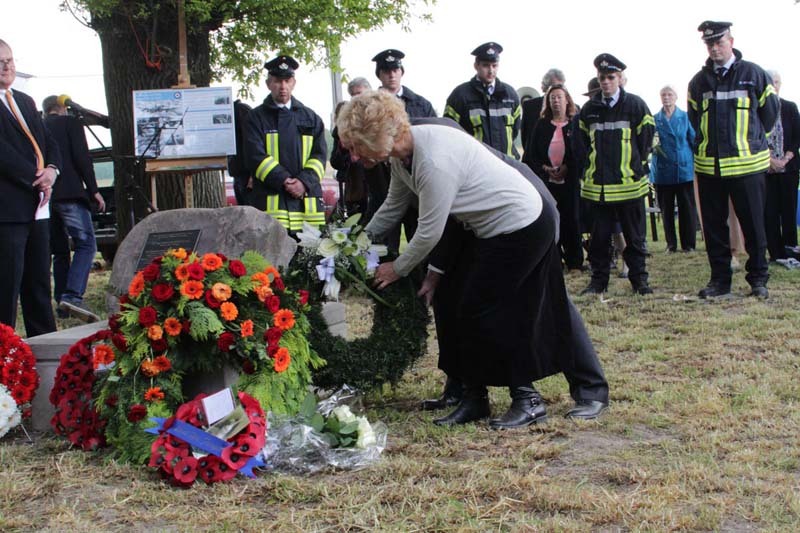 Huge thanks go to all the people of Haldern who donated to and supported the memorial, and to all those who travelled to Germany to take part in the ceremony. Pictures below by Wim Govaerts and Mitch Buiting. 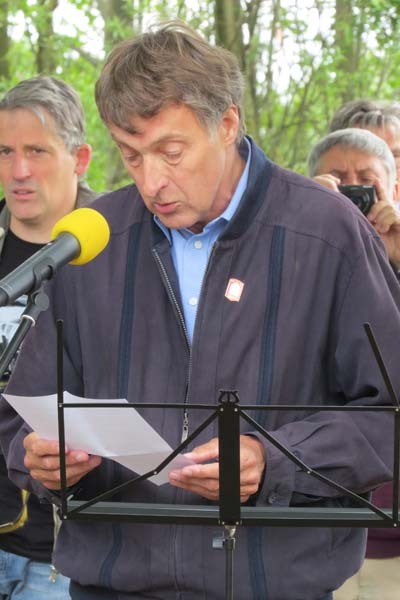 Volker Schürmann being interviewed by British Forces Broadcasting Service reporter, Rob Olver. The crew of AJ-E. Left to right: Norman Barlow, Leslie Whillis, Philip Burgess, Charles Williams, Alan Gillespie, Harvey Glinz, Jack Liddell. Eight crews from 617 Squadron were lost on the night of the Dams Raid, 16/17 May 1943. 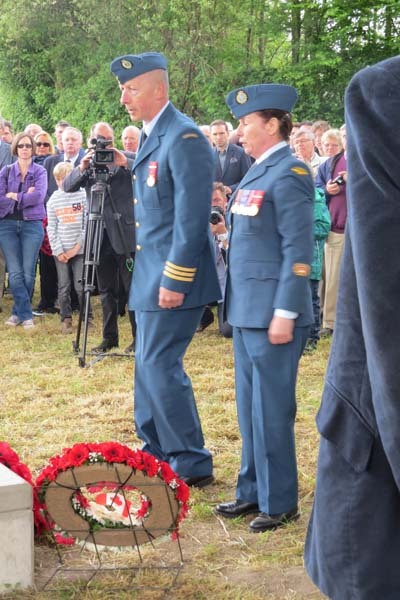 Of these two, AJ-A piloted by Sqn Ldr Melvin Young and AJ-K piloted by Plt Off Vernon Byers were lost over the sea, but the other six crashed on dry land in Germany or the Netherlands. 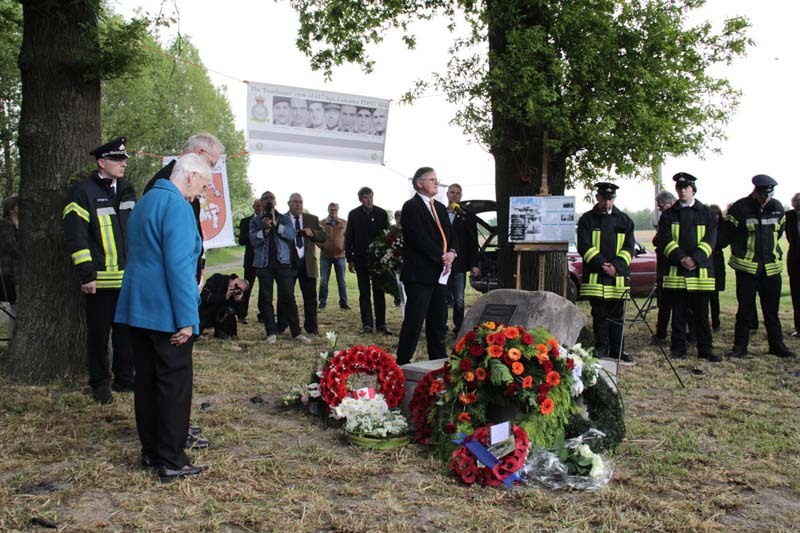 An appeal has now been launched to add another memorial to this list. 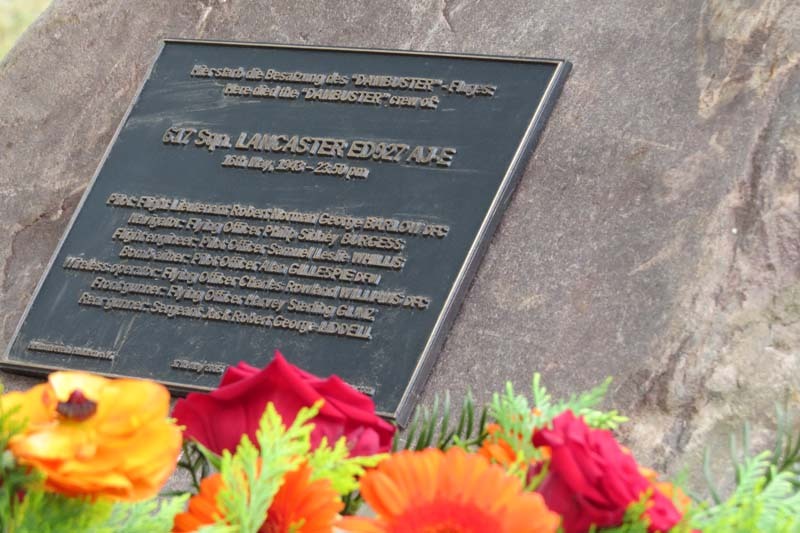 Lancaster ED927, call sign AJ-E, piloted by Flt Lt Norman Barlow DFC, crashed into a electricity pylon on some farmland near Haldern, at about 2350 on 16 May 1943, killing all on board. 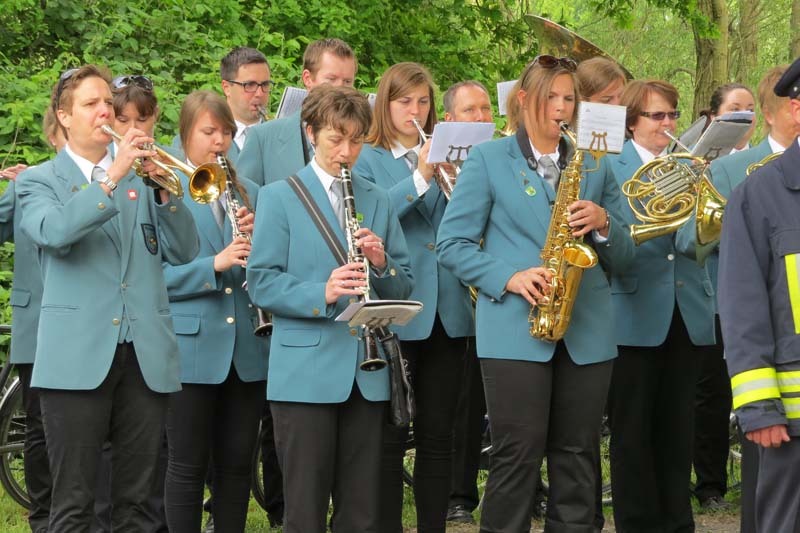 Haldern is a community in the district of Cleves, in the lower Rhine area. 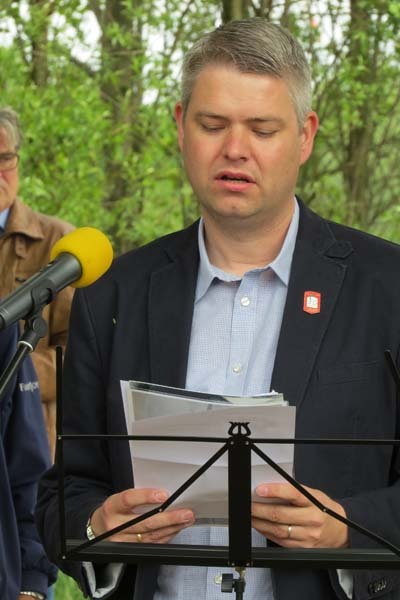 The plan, to erect a memorial stone and bronze plaque on this site, is being organised by Volker Schürmann, a local historian, who is looking to raise €750 (about £620) to cover the cost. We are therefore looking for 150 donations of €5. 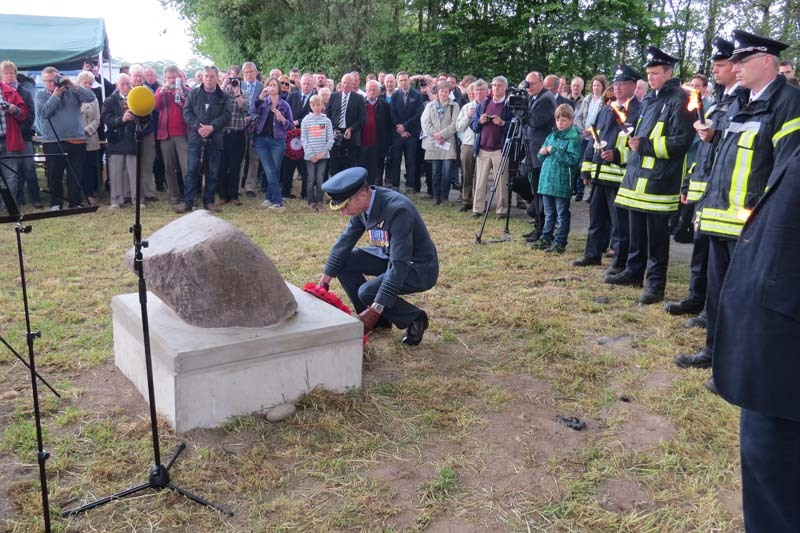 By way of thank you, donors will receive a colour souvenir postcard featuring pictures of the finished stone in place and portraits of all the AJ-E crew. 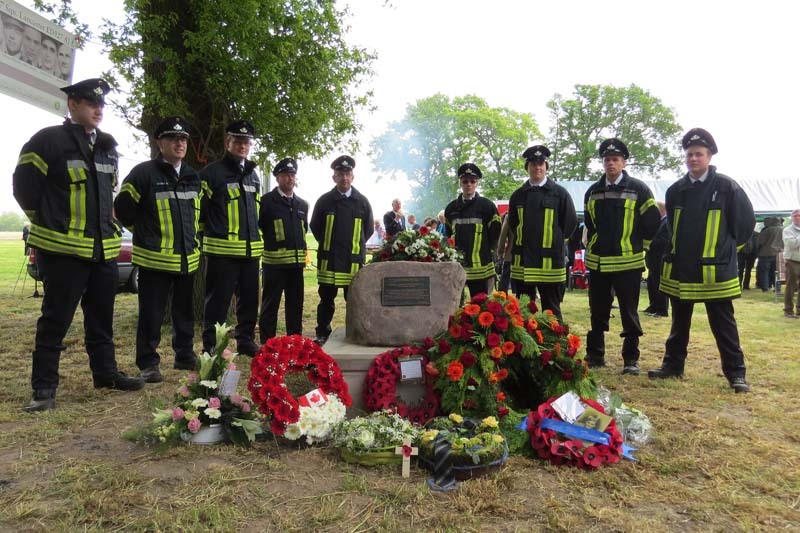 It is hoped that we can arrange for a descendant of one of the crew to be present when the stone is unveiled, and, of course, all donors will also be warmly welcomed. If you would prefer to make a donation by cheque or bank transfer, contact me and I will give you details of how you can do this. 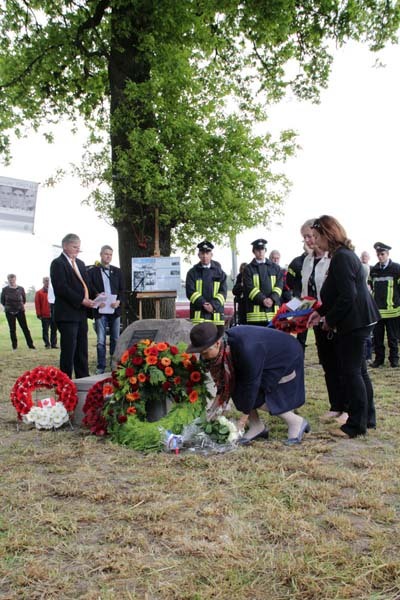 Below is a picture of the site where the memorial will be erected.